There’s no denying the energy and excitement surrounding downtown KC and many other historic neighborhoods around the metro due to redevelopment. But if you’re looking for a brand new part of the city to explore, take a trip out to Southern Joco and venture through a steadily-growing wonderland: Prairiefire. With the first phase just 3 years old and the 2nd underway, the mixed-use development of shops, restaurants, entertainment, & education is a perfect weekend adventure to fill your Saturday or Sunday. Get the morning started or cap the night off at coffee & dessert bar Decadent, where everything is made from scratch daily. Enjoy a wide range of coffees and scrumptious eats that’ll satisfy even the sweetest tooth. From homemade twinkies to macaroons, doughnut sandwiches to exotic coffees, there’s something for everyone here. Next up is the Museum at Prairiefire: through partnerships with the American Museum of Natural History in New York City, some incredible world-class exhibits can be found right here in KC. An ever-evolving exhibition showcases the biggest, smallest, and most amazing species of all time. The fun doesn’t stop there– venture right outside to “The Wetlands” where you can get fresh air, a bit of exercise, and learn about the various species that call this habitat home. After getting an education it's off to Cinetopia where you can wine and dine while catching that movie you’ve been waiting to see. By far one of the coolest film experiences in the city, there is a variety of theaters to choose from depending on the occasion and how much you’re willing to spend. If you simply want to enjoy a good flick, you can do so in their main auditoriums, or you can indulge in a more private viewing experience in one of the living room theaters. Take a short walk across the street and venture into some of Prairiefire's shops. Fat Brain Toys is not just for kids– step inside and your adolescent self is sure to take over. Clothing boutiques gear mostly towards women, but one shop in particular is for everyone: Made In KC. From apparel to home goods to accessories and more, they have a wide selection of locally made items to show off your KC pride. Finally: eats! My top three: Grimaldi’s Coal Brick Pizzeria, Rock & Brews, and Pinstripes Bistro. Grimaldi's was voted “Best Pizza” by the Food Network, and if you take just one bite of The Don, you’ll see why. I could literally eat here every night of the week and feel no shame. Secondly, Rock & Brews, which is exactly that: Rock music, a variety of cold beers on tap, and bar food with a twist. My personal favorite is the Salmon BLT. 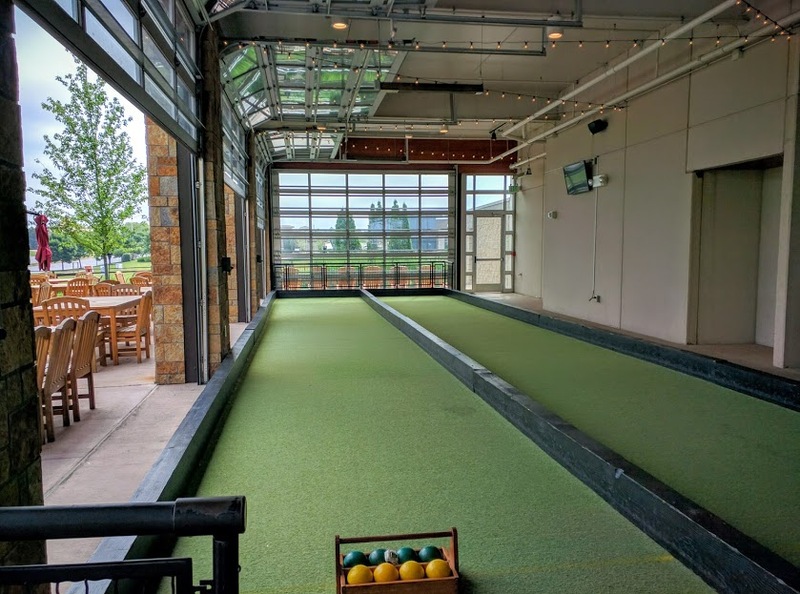 Lastly, Pinstripes: a bowling alley & bocce bistro with Italian/American Flare. If you like brunch, this is the spot to be on Sunday. The party starts at 10am and ends at 2pm. A bottomless brunch buffet where the food stays hot and the drinks keep runnin’. As phase II continues to take shape, I imagine there will be more entertainment and attractions to experience at Prairiefire. For now, the current setup is perfect for a fun day of weekend adventure. Hope you enjoyed this weekend guide.